Ald. Mark Tendam (6th) at a city meeting Monday night. After eight years on City Council, Tendam is one of five candidates vying to be Evanston’s next mayor. When Ald. Mark Tendam (6th) moved to Evanston 23 years ago, something inside him changed. After eight years on City Council, Tendam said he’s ready for a new chapter — one that he hopes will encompass a wider constituency than his northwest ward. He formally announced his bid for Evanston mayor in mid-October. If elected, Tendam said he hopes to prioritize job creation and affordable housing, focusing particularly on those who are homeless or struggle with mental health issues or substance abuse. Tendam and his husband, Neal Moglin, moved to Evanston from Chicago in the 1990s. Tendam and Moglin both grew up in small towns and appreciated Evanston’s close-knit community, Tendam said. He also said he visited Evanston frequently during his childhood to see a close family friend, and had felt a connection to the city ever since. The city’s strong record on LGBTQ rights added to its appeal, he said. Once he became ingrained in the city, Tendam said he got involved with Better Existence with HIV, a since-shuttered organization which worked to improve the lives of people with HIV/AIDS. After becoming a BEHIV board member, Tendam appeared before City Council to request funding, where he said he faced a “firing squad.” That experience fueled his desire to seek public office in 2005. Tendam said after the loss he ramped up his involvement in the community, joining the McGaw YMCA board. He sought election once again in 2009, and won — becoming the city’s first openly gay alderman. “Mark talks a lot about not really being able to be himself until he came here, and I think he really values the community and wants to make it like that for everyone,” said Eliana Chavkin, Tendam’s deputy campaign manager. As 6th Ward alderman, Tendam was “amazingly responsive,” ward resident Virginia Mann said. Mann pointed to Tendam’s work with the Evanston Animal Shelter as an example of his hardworking nature and ability to build consensus. The shelter’s former ownership, Community Animal Rescue Effort, was removed in 2014 after concerns over high euthanasia rates. Tendam played an instrumental role in educating the council on the best course of action with the shelter, and helping install its current leadership, the Evanston Animal Shelter Association, Mann said. Josh Chernoff, Tendam’s campaign co-chair, echoed Mann, saying Tendam is “accessible” and helps seek compromise. 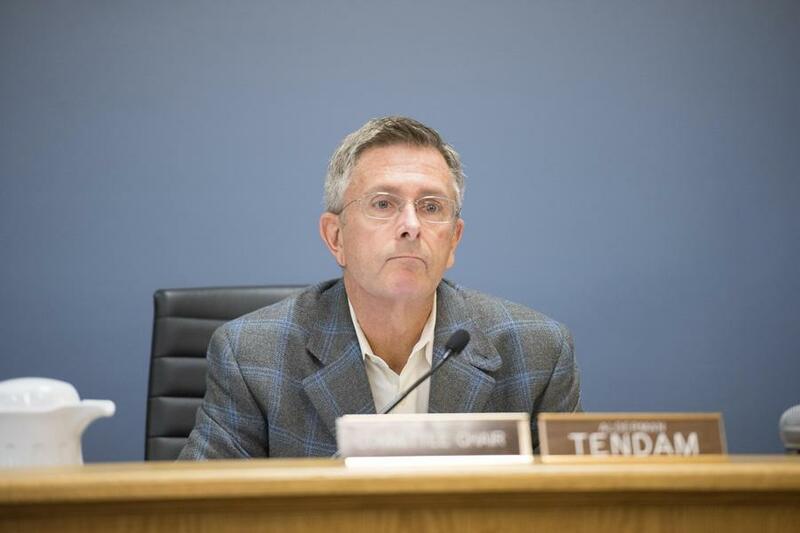 Chernoff said Tendam is focused on issues such as economic development, but also social justice and affordable housing. Tendam would be effective at striking a balance between the varied needs of Evanston residents, he said. “He’s been very involved in finding ways to create economic development in the community here while respecting the needs of people who are interested in preserving the character of Evanston,” Chernoff said. And Chavkin said Tendam would bring a unique knowledge of the city and its government to the office of mayor, despite his not being from Evanston originally. After years focusing on the 6th Ward, Tendam said he’s excited by the opportunity to widen his scope. Following President Donald Trump’s election victory, Tendam said he questioned whether he wanted to go through with the mayoral bid. But then he said he realized that seeking office is an effective way to oppose an administration with which he vehemently disagrees. If elected, Tendam said he would fiercely defend the progressive ideals of Evanston that drew him to the city in the first place. He said he would “without hesitation” continue the city’s “welcoming” status, even in the face of potential federal funding cuts called for in Trump’s executive order.